We have learnt what Functions Words (虚词) are, and 2 of the particles : 了 and 的, which are also part of the function words. We have learnt the character ” 得 ” here. We are going to look into the grammar aspect of the character. There are 3 pronunciations for 得: děi , de , dé . When 得 acts as a particle, it is pronounced as de . 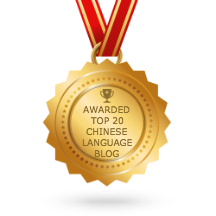 As a structural particle, 得 is used to link a verb or an adjective to a complement which describes the manner or degree (degree complement). Note: Unless you’ve spent time studying grammar or linguistics, you probably won’t have heard of complements. Read more about complement (linguistics) here. The degree complement assesses the extent or quality of an action, or the state of things after it. It is used to assess or describe verbs or adjectives. This book is very well-written. For the first example, ‘非常好’ (very well) is the quality of the verb ‘写’ (write) and it is marked by 得. For the second example, ‘很快’ (very quickly) is the quality of the verb ‘吃’ (eat) and it is marked by 得. 得 directly follows the verb in a sentence. He was so happy he started jumping up and down. For the third example, ‘跳起来了’ describes adjective ‘高兴’ (happy). This often matches up with the English structure ‘so (adjective) that …’ . As exercise, try to make a few sentences with ” 得 + Degree Complement ” sentence structure at comment section. We will talk about ” 得 + Potential Complement ” next week. Stay tuned. Subject +　ｖｅｒｂ　＋de + adverb? I guess thats my first question, what is the structure to follow? ｉｓ　ｈｅｎ３　ｈａｏ３　ｎｏｔ　ａ　ｍｏｄｉｆｉｅｒ　ｏｆ　ｓｈｕｏ１？an adverb of the verb speak? I hope my brief explanation will answer your question. I think a complement is a word or group of words that include adverb. I am not a linguistic expert so if I make any mistake, please correct me. 你坐这里 – You can say it this way too and this way seems more correct to me. I think the difference between the above two is that the first one is saying “Please have a sit here” and the second one is like “you sit here”…? Also forgot to add how do i know whcih structures need 得 and which dont? in the example belowy 你坐这里。。 you dont say 你坐得这里 but why? Your above examples are correct : 你这里坐 and 你坐这里. I think you understand the meaning between the two.